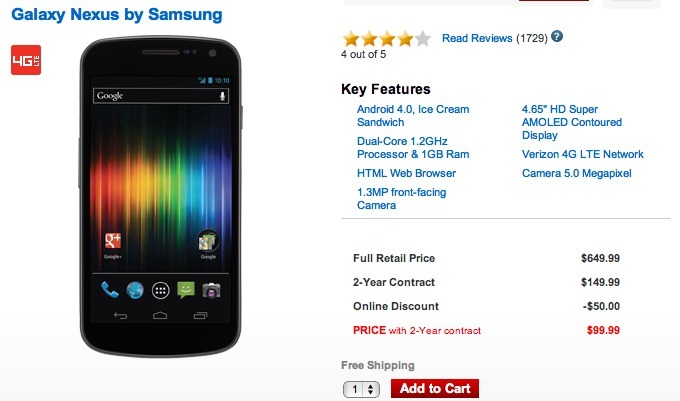 The Galaxy Nexus LTE on Verizon has dropped to $99 this morning. It’s tough to tell if this is a sign that the device is on the way out or not, but this is the lowest we have seen Big Red sell it yet. With the Galaxy S3 now available, many of these devices that were introduced months ago, probably don’t stand much of a chance unless their prices are dropped significantly like this. To many, this is still the best phone available because it is fully stock, a “developer” device, and will likely always have the newest version of Android before the rest of the players, even if Verizon takes their sweet time approving builds for it.